These are a few of our favorites for the month of March. 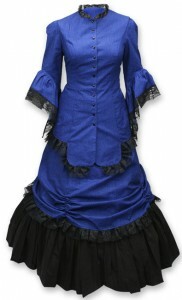 Lucille Walking Suit, Royal: Was a hit! I was invited to a party with an ‘Old West” Theme. The site of the party was in a historic home with its own saloon. My dress was era perfect and a hit with all the guests. I loved the fit and quality of the dress. Found it to be very comfortable and flattering. Thanks for helping to me to ‘fit’ in and stand out! 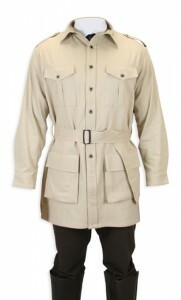 The jacket seems to be just what I wanted, as the foundation of an outfit for an explorer/steampunk themed wedding. It’s stylish and practical, lots of pockets and should be easy to wash.
Also not too hot: a problem with warm weather is not having enough pockets, and this should help there. The colour was fine for me, but is a lot lighter than most people would understand by “Khaki” – so maybe some will be less delighted than I was. 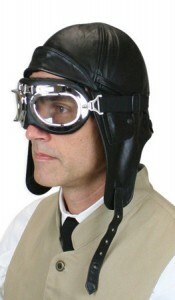 The Aviator Helmet was great. It fits well and appears to be well manufactured. It got a lot of looks and people wanted to try it on. I will probably be purchasing a second one now that I have seen the quality that it is. People say you get what you pay for, I think I got more than my money’s worth on this purchase. This is not a cheep helmet like you would purchase in a costume shop. I have ordered many items from the Historical Emporium and have never been disappointed. The items are always delivered in a timely manner. I enjoy the fit and authenticity of the Baxter Knickers.They seem a bit big on me, but I hope that is a reflection of me finally losing some much needed weight. A baggy fit actually is the authentic fit. Fontaine Vest – Green: Eye-catching! 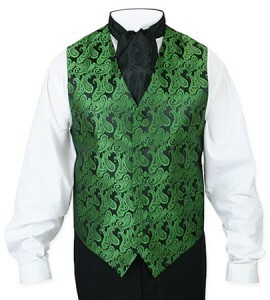 The green Fontaine vest is superb! I perform magic and am very busy with St. Patrick’s Day events. So far, at every event I’ve performed at I have received many, many compliments on my vest. The vest fits well, is very comfortable to perform in, and makes me stand out in a crowd, which is necessary when performing at events where I need to mingle with the crowd to perform.